Microsoft Office 2010 has been released by Microsoft. 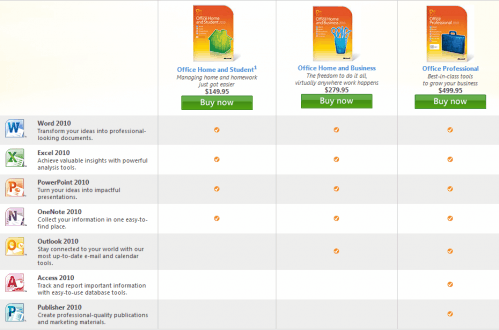 The popular Office suite is available in three different editions in retail shops: Office Home and Business 2010, Office Home and Student 2010 and Office Professional 2010. Office Home and Student 2010 is the basic Office edition retailing for $149.99. It includes the core Office modules Word, Excel, PowerPoint and OneNote. Next in line is Office Home and Business 2010 which retails for $279.95. It includes Microsoft Outlook on top of the modules offered in the basic edition. Top of the line product Office 2010 Professional retails for $499.95. It is the only retail Office edition that includes Access 2010 and Publisher 2010. Some customers, especially those that have not participated in the Office 2010 Beta might want to download trial versions of Microsoft Office 2010 before deciding whether to buy the new version or not. 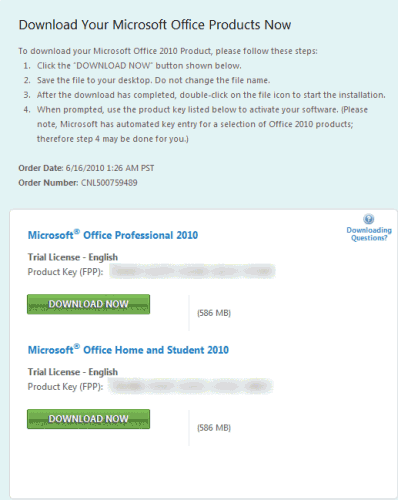 Trial downloads are available for all three retail Office 2010 editions. Office 2010 can either be downloaded directly from Microsoft after logging in with a Windows Live account. The Office 2010 product key that is generated after logging in will activate the software for 60 days. Below are the direct download links for all Office 2010 editions. Please note that these versions are the English versions. The downloads can be initiated right away. The trial product key can be requested on this page over that the Microsoft Office website. Update: Downloads are note provided anymore for this particular version. You can download a trial version of Office 2013 currently which is useful. Especially those that have not participated in the Office 2010 Beta might want to download trial versions of Microsoft Office 2010 before deciding whether to buy the new version or not. The try it now button leads to a Windows Live login form. It might be necessary to fill out the first and last name as well as the country before the Office product keys and download links are displayed. Product keys are displayed on the same page after the login. System requirements for all editions of Office 2010 are nearly identical. Will you be buying Microsoft Office 2010? Let us know in the comments. Office 2010 users who want to test the new version for more than 60 days should take a look at the Office 2010 rearm instructions to do so. Update: Downloads are no longer provided by Microsoft. If you download all the three files, you will notice that all of them are the same file with the exact same hash. Oh, and there’s the ultimate Steal as well for students to get Professional Academic. Of course not. Way too expensive. Access and Excel would be the only things I need and 500$ for that is too much. I’ll stick to OpenOffice. Thanks for the great coverage of the new Office 2010! I just wanted to stop by and let everyone know that you can win a free copy of Office 2010 through our ‘Win 2010’ contest- just swing by our Facebook page and let us know how you will ‘Make it great’ with the new Office 2010. Feel free to send me any questions you might have about the contest or Office 2010, I would be more than happy to help. i want t ask about the serial number!!! I purchased the windows Office 2010 and I am not able to open any of my old word documents, please help me, the message I get is the program does not have an association…..
Clarence, you can either load the documents from within Office 2010 or fix the associations so that the files are loaded into Office whenever you double-click them. pls contact microsoft service to enhance performance…. is the download free ? I need a serial number, please. Can Microsoft Access 2010 be downloaded for a free trial or is it only available for retail? I this for the Full Version? I have bought Microsoft Office Home n Student 2010 but as i only have office 2007 on my pc i don’t know if I can use it? so i have downloaded the trial but i dont have the product key where would i find this? I need to download this software because I want to know whats new in this software . After the 60 day trial is it possible to activate it with a bought licence key? The reason i ask is that i bought home and business but it did not come with a cd only a product key, so can i download this and then use my own license key? Sorry and is this download for 32bit or 64bit? I’ll be able to activate the full version through this trial one, right? I try this trial version, Excellent service. So, I’ve downloaded the trial version of the software I want to try out and expect to purchase — but now it’s asking me for a key, which I don’t have. I see about 10 other people have had the same problem. What’s the key to use? Where do we get it? Is this some kind of secret? Those w/ more updated Office versions (those familiar w/ the ribbon), is a new & improved (tighter & sleeker) version of the same. **Am a professional writer. I stayed w/ XP until 2010 Office. LSS: Am “head over heels in love” w/ (Home & Business) Office 2010! Could I please get the product key? It is the product key for MS Office 2010 Professional that I require. Thank you very much. i downloaded the 2010 trial version and need a product key. Can you provide one? Nice one. I’ve just had to reinstall Windows 7 on a clients notebook and noticed there was a, ‘Microsoft Product Identifier’, card with a product key for Office Home and Business 2010 with it. But, there was no Office disc or software in with the bundled discs. So, this download was exactly what I was looking for. Run it, and used the product key on the card, and everything as I want it. I download micro soft 2010, but trial ran out, can I re install it again for another 60 days,or do I have to buy it now. i need Microsoft office to my phone. For everyone asking, you’ll receive a product key for your trial in your email. The email will be titled Microsoft Office 2010 – Order Confirmation. I go thru the steps but I am not getting an email with the product key. Is there any other way or is it not working now? LSS: NO KEY IS NEEDED FOR THE TRIAL! You get a 30-60 day free trial of MS Office (depending site & timing), fully functional. *Then* after your trial period ends, you can BUY the fully functional version (exactly the same as trial version, pre-expiration) & when your pyt clears, THEN MS emails the product key. (The trial version *can* be used, albeit w/ “limited functionality,” post-expiration but is “worthless” ~ imho). Pls, ignore my prior (KEY) comment (unless the moderator reads this & does so, first). Hi, Please send me product key for trial. I do not see where to get the product key. I have downloaded it and I am in my microsoft account and I have checked my email. Still not able to get product key. Can anyone help? Hi..downloaded 2010 Office version from this site.looking for product Key…please. hi.. i have to microsoft office pro 2010 download but don’t know product key’s plz send the product key’s on my gmail account’. kindly plz. Thank you for the link! A friend had a bad turn with an update that caused the MBR to be come corrupted. When she purchased the laptop, MS Office Home and Student 2010 was preinstalled. Once the HD was reformatted and the OS reloaded, we needed to find the download for Home and Student 2010 and your website has gotten her back up and running! Definitely going to recommend others visit this site for help! Tkx bro……the link is great. I need the product key. Another “edition” or version of this is the Microsoft Office 2010 starter, which does not expire, and provides you with Microsoft Word Starter and Microsoft Excel Starter. You can learn more about it, and even download it here. I would like to note that this does NOT expire, and does not need a product key. It is 100% free to download and free to use forever. I’m in college and have not had any problems using this “starter” version of microsoft word. Thanks! More than good enough for my needs right now. I downloaded the 2010 trial version and need a product key. Can you provide one please? Tx! I downloaded the 2010 trial version and need a product key. Just wanted to drop a short thanks for posting the trial key. This helped me a lot while preparing an image for a client. Thank you, Jobennie! i recommend to use open office. it is 100% free download…. I recommend Libreoffice. Free just like open office, but has a stronger more active developer base = better compatibility, more features.